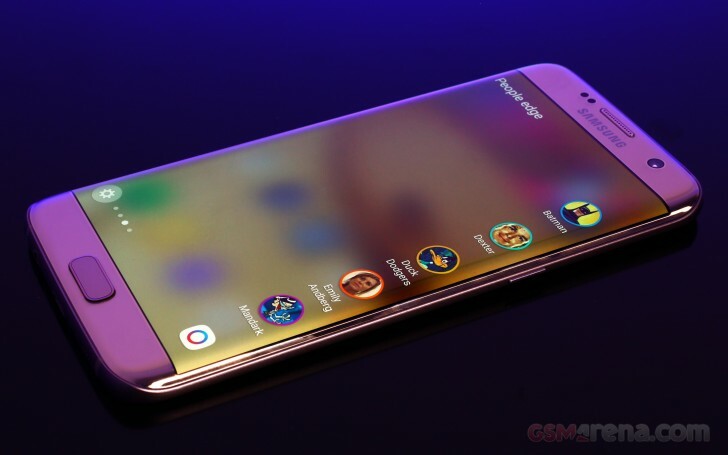 Since it's an edge model, the Galaxy S7 edge comes with a few exclusive software features to utilize the curved space. With the addition of Always-on option though, one of the highlights from the previous edge generation has been moved to its settings - it's like a night mode of the big always-on screen. There are three edge features on the Galaxy S7 edge - Edge Panels, Edge Feeds, Edge Lighting. The Edge Panels are available everywhere throughout the interface and you can assign the position, size and transparency of the edge shortcut. Those new panels are more like some exclusive mini homescreens. One of the panels gives you app shortcuts, another has your favorite task hotkeys, then there is the one holding your favorite contacts. There are even more panels - Bookmarks, Weather, Calendar with Events, My Places, Compass (with ruler and flashlight). You can rearrange the panels as you wish, you can download more from the store, too. While those panels are cool, and you can have them all at once (they are swipe-able), we found it pointless to have more than one. The edge feeds are back - those can be awoken with a short swipe and then swipe down gesture and it will light up brightly. If you have more than one feed (RSS, missed notifications, CNN, activity tracking), you can scroll between the different info feeds with a swipe. The edge feeds disable your always on screen and then lights up, which is rather awkward and honestly, unnecessary. The always-on display is more than capable to handle some of these functions and you don't need special gestures to activate it (it's always on, remember). Edge lighting lights up by a notification or a call only if your device is lying face down. You can even reject a call with a pre-defined message by placing a finger on the heart-rate sensor for 2 seconds. While those edge features are cool, the always-on screen rendered most of them unnecessary. We don't mind the curved screen as a design element, but we can't imagine anyone using these software gimmicks for more than a show off. Samsung is really determined the make the Virtual Reality a mainstream thing this year. It even used VR headsets to stream its last UNPACKED event to all attendees on the spot. And pre-orders of the Galaxy S7 or S7 edge came with a free Gear VR headset on many markets. But the company made sure it provides the users with a full package of VR gear - you can opt additionally for the Gear 360 camera, which will snap VR photos and videos for you. The Gear VR is powered by Oculus technology so all the Oculus VR content is available to the Gear VR users as long as they have the Galaxy S6, S6 edge, S6 edge+, Note5, S7, and S7 edge. You just snap the phone in the slot and you are ready to go. Naturally, we got our hands on a Gear VR headset and did a quick tour with the Galaxy S7 edge. The Gear VR puts you in a comfortable room, which should help you get used with the whole VR thing. Some people may get dizzy at first, other may even become sick, so you should experiment with the Gear VR gradually - try it for a few short minutes at first before having a longer session. So, in this VR room you get the default menu. Oculus provides enough content to get you started - there is a whole world of 360 photos within the Oculus Photos gallery. They are grouped by continents, countries, and cities. There are a few other galleries for different contest winners, your favorite 360 photos, the 360 photos you've preloaded on your phone, among others. The Oculus Photos app has so many images of different places that you can lose weeks before you see them all. And it may be even impossible to do so, as new VR shots are added regularly. The Oculus Video hub isn't as impressive as the Photos app. There are quite a few videos to get you started, but you should refer to other sources rather quickly (Facebook, YouTube, etc.). If a video is not a VR one, you can choose a cinema setup to fill the empty 3D space, which is quite a cool gimmick and we had fun time using it. There are a few games available in the Oculus Store, but most of them were awful. Once the games advance enough they will make you use an Xbox or similar controller and then the Gear VR and Oculus will be fully utilizing the VR capabilities. For now - the Oculus games are just demos of the VR tech rather than something meaningful and entertaining. As far as the quality is concerned - graphics quality is far from ideal, but we didn't expect them to be. The resolution is low and you can see the individual pixels and this may take time to get used to. In the 4K era going back to something close to the VGA resolution isn't a small bite and not everyone will be able to switch that fast. We don't see the Gear VR as a gaming tool, but more like a multimedia explorer. Somewhat we doubt the games will be its moving force, at least today. But we bet user-created multimedia content should provide a big enough hype to get more and more people hooked up. What's better than reliving your awesome vacations and memories once again, at the comfort of your couch? We don't know about the gaming thing yet, but we'd take a Gear 360 camera and a Gear VR headset in a heartbeat just to explore the world from home. And hopefully, the VR world quality will get better.